New Pig oil-only spill kit in high-visibility bag. Pig absorbents in the ideal spill kit bag - hi-viz, water-resistant, and easy to close, hang and carry. Durable, water-resistant bag with hook-and-loop closure keeps contents clean and dry. Pig oil-only socks stop spreading spills; Pig Stat-Mat pads absorb quickly. Absorbents meet NFPA 99 standards for static decay to allow use with fuels and flammables. Temporary disposal bags help make cleanup easier. Bright-yellow bag and large, color-coded label make the kit easy to locate. Strap for easy carrying and hanging. Compact and easy to store - makes a great truck spill kit. 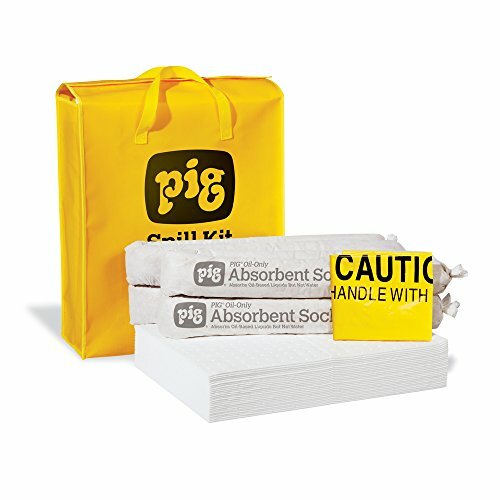 Only Pig spill kits feature Pig absorbents proven for rapid response. Fluids absorbed: oil-based liquids but not water. Absorbency: up to 10 gallon. Spill volume: 10 - 19 gallon. Composition: bag - vinyl-laminated nylon; sock skin - polypropylene; filler - hydrophobic cellulose and mats - polypropylene. Kit Includes: 4 - 48-inches Pig oil-only socks; 28 - Pig Stat-Mat absorbent; 5 - Temporary disposal bags and ties and 1 - 21-3/4-inches length by 17-1/4-inches width by 7-1/4-inches depth carry bag.